Anybody else playing bf1 just to get bfv skins/tokens? Today is the first day to get the last paratrooper token or whatever it was called. Not sure how long it lasts....i’m assuming one week. Remember to claim them after you earn them. Seeing as how I'm also getting Deluxe, I'm getting what, 7 or 8 Paratrooper sets? Gotta represent my Fallschirmjäger! Yes I am. The Road to BFV has actually kept me engaged with BF1, they should have implemented this from day 1. Ha, I had to look that up. The only german word I know is jagermeister. I know, just not a big fan of BF4. Yup. Only reason bf1 isnt deleted. 20000 points and claim and quit. I'll be honest, all my german knowledge comes from WWII games and movies :P Oh, and Rammstein of course! LOL at people that only play for this stuff. It’s like being for married for 10 years, after a while you have to throw out a bribe to have fun. No, I'm enjoying bf1 even at this point of its life cycle. I’m pretty much the same I while am starting to tire a bit from all the prone lmgs, headless zerging assualts, and teams that have no clue what a flag is. Nope, still having fun. I enjoyed BF1 for 2 years, its time to swap it for BF5, but that wont happen till 09.11.2018! Nope. Still having fun and loving BF1. Hated BFV beta and won't be buying unless it gets rave reviews and goes on sale 6 months from now. It's what made me decide to start playing again, but it's not the only reason I keep playing though. I finished it earlier yesterday, but I still ended up playing more later in the day just for something to do. Was having some fun wrecking with the SMG 08/18, LMG 08/18, and the Arisaka Patrol. Plus a little AL8 Marksman and Farquhar Hill Optical action in there too. I think I need to start focusing on using the SLRs more to get ready for BFV though. Especially ones like the AL8 or RSC since they've got similar mag counts to the SLRs that recon gets in BFV, and I intend to use those weapons a lot. I probably won't play BF1 anymore after BFV comes out though unless it's a flop. 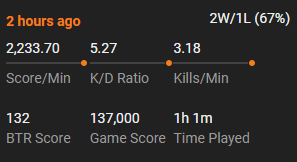 I've been enjoying BF1 for the most part, but these days I'm only playing to get the BFV stuff. I enjoyed the BFV beta, so i will likely enjoy the game at release, in which case it's most likely byebye BF1. Might end up playing it every now and then though. But first couple of months i'll probably be busy with having fun in BFV. If you're on Xbox you might see a spike in population considering the game is free for the month of November. I reinstalled it just so i could do this ^^^. War thunder just became free to play on xbox so ill play that until nov 15th. I just left it on hard drive for now, it is reserveing space for bf5 lol.